Trace amounts of more than 40 different explosives and drugs can be detected and identified within only some seconds. By means of gentle puffs of air particles trapped on hair, body, clothes and shoes are dislodged. Aided by gravity and a downward airflow these particles are then directed into the PKI 8310 for analysis. Operation is done by an easy-to-handle color touch screen display. In case of an alarm the color printer will automatically print the digital photos taken during the screening process. Control of people is done full automatically head-to-toe. Up to 6 people can be controlled per minute. 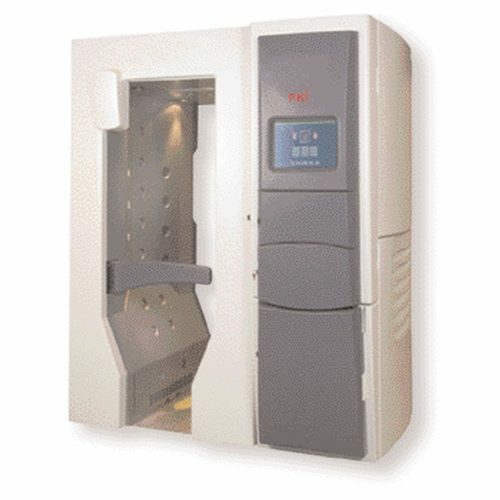 With this high throughput, PKI 8310 is ideal for applications where large numbers of people need to be screened for threats quickly, such as at airports, customs, military bases, correctional facilities and high profile facilities.